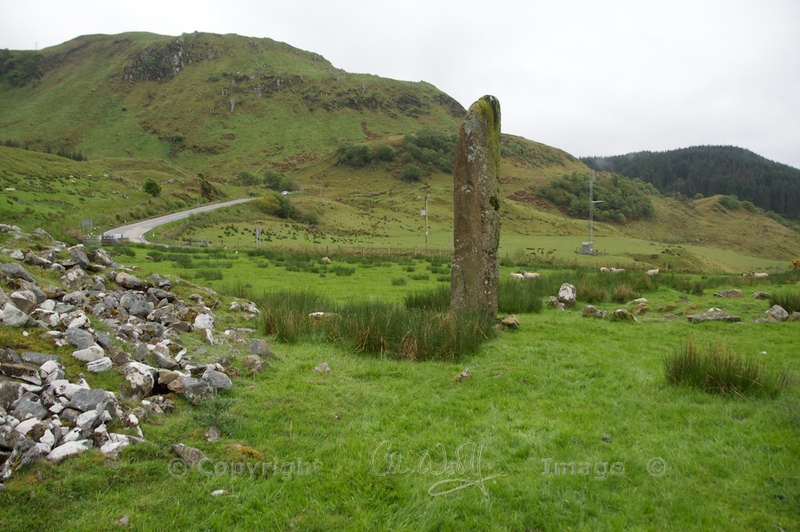 I don’t know how many times we must have driven past the standing stone at Kintraw in Argyll without seeing it. This is a shameful thing to admit, because it’s not hidden among trees, nor is it a rounded hump of a boulder like the stones at Fortingall in Perthshire. 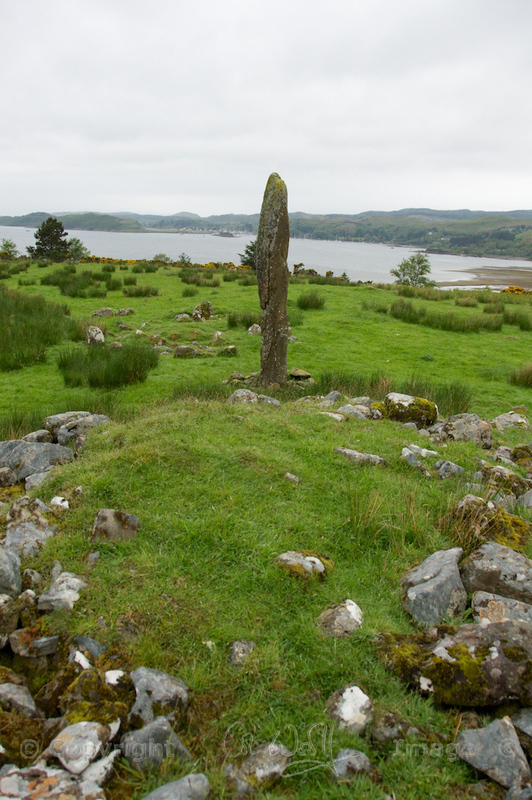 It stands alone and upright, all 13 feet of it, overlooking the wide expanse of Loch Craignish. A few miles south of Kilmelford, the road snakes in a series of S-bends around the low hills, sea lochs and promontories that make the coast of Argyll so beautiful. Just as you’re climbing up from the shore of Loch Craignish, drag your gaze away from the lovely sea view and look to your left. The standing stone will surprise you, as it rises up finger-like from a farmer’s field. When we last came this way it was beginning to rain. The mist was hugging the hills and blurring the lines between land and sea. It was soft rain, the kind that wets you thoroughly and makes every surface slippery to walk on. The sheep watched warily as I climbed over the gate. I had read next to nothing about this standing stone before visiting, so I didn’t know what to expect. It stands beside a rubble-strewn mound about 40 feet in diameter, which I recognised as a cairn similar to Dunchraigaig in Kilmartin Glen, but I totally missed the fact that there was another, smaller cairn just to the south-west. Later, on reading up about the site, I found that there is, in addition, a ring of small stones to the north-west of the cairns, and a couple of large boulders which are thought to be the remnants of a four-stone alignment. That’s not to mention a scattering of other mounds in the vicinity that may once have been cairns, and the remains of a large hill fort known as Dun na Ban-Oige on the crag behind. Let’s face it, wherever you put your feet around here is a potential historical site! But first, the monolith. Up close, it’s extremely impressive, and it must be one of the tallest standing stones I’ve seen outside of Callanish on the Isle of Lewis. 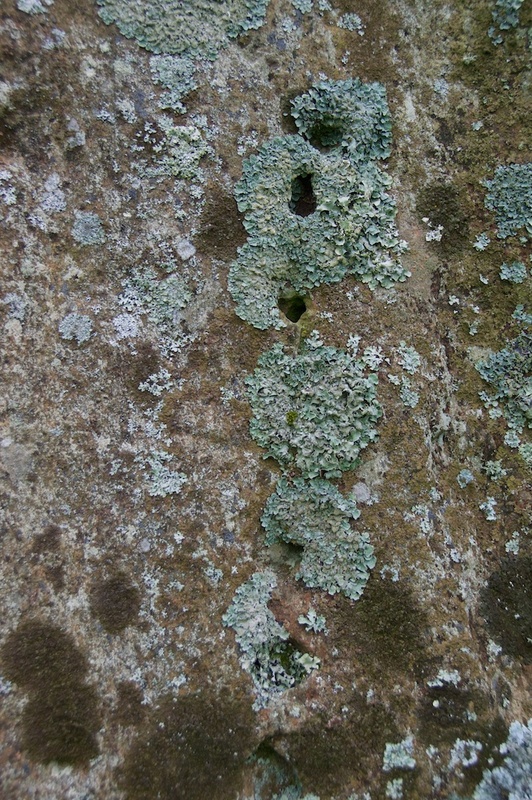 The surface is rough with lichen, but I found no features except for a row of finger-sized holes which may just be a natural crack or seam that has been eroded with the weather. A couple of sources suggest they may be cup-marks, whose significance is now lost. In the photo above, can you see an elongated face, viewed side on? Or have I been looking at it too long? There wasn’t an information board (sometimes sites like these are much better without them) and the sheep weren’t giving anything away. Once they’d satisfied themselves that I hadn’t come to feed them, they lost interest rapidly. 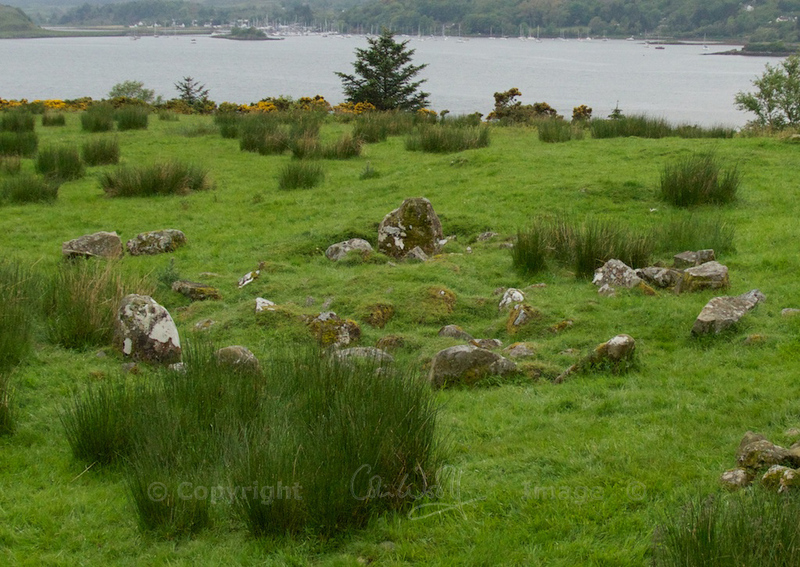 I wandered up and over the mound, photographing the wonderful backdrop of Loch Craignish which was gradually disappearing in the rain. 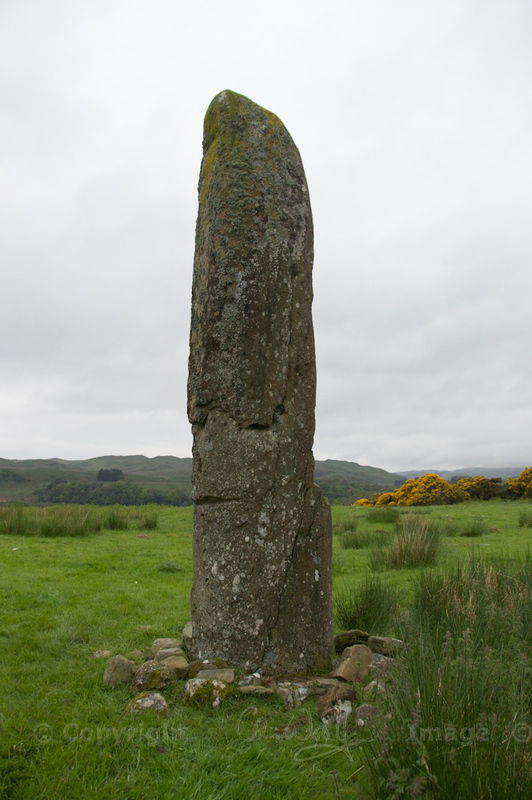 Looking at historical records, it appears that the standing stone was leaning over until 1979, when bad weather caused it to topple completely, revealing that a further three feet of its length had been buried below ground. Afterwards the stone was re-erected in the same socket, but on a slightly different axis. Luckily, records still exist of the stone’s original orientation, together with a report on the excavation of the mound which was done in 1959 by D D A Simpson. It’s amazing how much imagination can be stirred by just a scrap of folk memory! What did the archaeologists find? On the north-west edge of the mound they discovered a segmented burial cist which contained traces of cremated bone and carbonised wood. There was no evidence of any burial at the mound’s centre, but remnants of wood in this area suggested the existence of a wooden post. On the south-western edge a ‘false portal’, in other words a shallow opening that leads to nowhere, was discovered behind a large recumbent stone that may once have stood upright. Finds from the mound included mussel and cockle shells, some teeth of an ox, sheep or goat, and six jet beads, along with a medieval bronze buckle. The RCAHMS warns that “none of these finds was necessarily contemporary with the cairn”, which it tentatively dates between 2000 and 1500 BC. Originally, the entire mound was likely to have been covered with stones of brilliant white quartz. The smaller cairn is only 11 feet wide, consisting of an arrangement of stones so random that someone untrained in archaeology (like me!) could easily overlook them. When it was excavated, one of the marking stones was found to form the side of a small cist about eight inches square, which yielded only carbonised wood. In practice, the mountains on the island of Jura would have been hidden from viewers standing on the cairn, because a low hill is in the way. Thom speculated that they may have climbed the hill behind the cairn in order to get a better view, allowing them to line up the mound, the standing stone and the notch. This does make sense: after all, you can’t easily witness the sunset or sunrise over a monolith if you’re standing right next to it: far better if you extend the line back and place yourself a couple of hundred yards away. But archaeologists have since argued that the sun would not have set in the ‘Jura notch’ four thousand years ago, but to the left of it, as seen from Kintraw. I wonder if we’re trying to be too specific, looking for precise mathematical solutions while totally missing the point. Meanwhile, there are more alignments… A second midwinter sunset line can be drawn through the mound’s central post hole and the false portal. The post hole and the burial cist on its north-west edge are aligned with sunset at midsummer; a cist in the smaller cairn, the standing stone and the central post hole of the mound line up with midsummer sunrise, while in the other direction they point towards the sunset in early November and February, marking important festivals known as Samhain and Imbolc in the ancient calendar. There is no evidence that Kintraw was ever a passage tomb, where the first rays of sunrise would have shone directly through into a central chamber on a certain day each year, and in any case its location makes this physically impossible. And what was the false portal for? I have yet to find an answer. It’s also quite possible that monuments such as Kintraw were created to record a one-off alignment, preserving a moment in time that the builders considered auspicious, and they may not have been intended for repeated observations. Finally, just to make the veil even mistier: Aubrey Burl, in ‘The Stone Circles of the British Isles’, speculates that the ‘outlier’ or standing stone at Kintraw may belong to the smaller cairn, with which it marks the midsummer sunrise, whereas the second, larger cairn was placed there at a later date, honouring the significance of an already ancient site. I find this idea quite convincing. It may even be that the larger cairn ‘grew’ out of a burial chamber the same size as its neighbour. When you’re looking at sites like these, I think there’s a limit to what you can do with logic. Digging, testing and measuring can only tell us so much. A couple of thousand years ago, the thread of some ancient wisdom was broken and, like a guttering candle, the light eventually went out. But somewhere, deep in our DNA, we know the answers. This was going to be a short article! Once the stones draw you in, there’s no looking back. I guess it goes to show that it’s always worth squelching around a sheep field in the rain. Do you love talking to stones? If you love mysterious and ancient sites, take a look at these other features on The Hazel Tree. 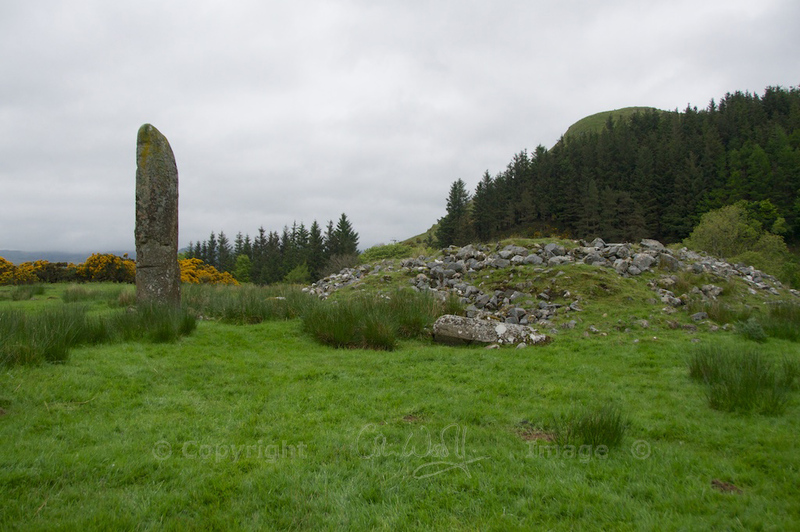 The first two are in Kilmartin Glen, just south of Kintraw. We often visited this magical site when we lived in the west, Jo. And I’ve read Thom’s book about possible significance. Standing stones & circles give off a mystical aura & have a mysterious draw – would love to travel back in time to find out how & why they were erected. (So enthralled are that we’ve put up our own standing stone in our garden!) Fabulous photos. This place looks amazing – definitely one to add to my ever increasing list of magical places to visit. I know, it’s a special place and you can tell it had great significance. I wouldn’t mind spending a quiet evening there and watching the sun go down! I know, Rachel, standing stones just seem to symbolise the aura and wisdom of ancient people. I’m so glad you can see the face! It looks to me as if he has a kind of half face-helmet, as if in battle. Thank you, Lynne! In the end I didn’t do much with the photos – the sombre sky seemed to suit the stone, and the grass really was that green. Yes, you’re right, it does resemble the Easter Island heads! I really want to go back and have another look at it, perhaps photograph it in another light, and from the south-west looking north-east. Excellent post. Craignish has an incredible amount of folklore for such a small area. A lot of my family originate from there and it’s always fascinating to read through all the old tales. It seems encounters with the Norsemen figure prominently in local folklore. The Battlefield at Barbreck and the cairns at Dail Nan Ceann are other examples I can think of off the top of my head. Thank you very much, Colin! I know, the whole area around there is so rich in ancient sites that it’s like entering another realm! A lovely place to have family ties. I will certainly be looking up those sites you mention, and I want to go back to Kilmartin too. Also you should check out a book called ‘Craignish Tales’ (there’s a link in the blog post), I think it is something you would find useful and interesting. Excellent, thank you very much! I’ll enjoy reading about that, and that book sounds very interesting. The thing about standing stones and similar pre-historic remains in the Highlands is that they have to compete with the general awesomeness of the surrounding country. A lot of deep sighing going on as I read this and hope very much that I get a trip up to Scotland during the summer. (Another wonderful post Jo, many thanks). This is a fascinating article. I have known this road since childhood, and the tall stone marking the grave of a Norse chieftain (as I always believed) haunted my dreams. I imagined his long sleep, looking westwards down Loch Craignish to where his longships had once sailed, their square sails catching the last light of the sun. But I have never stopped on that awkward bend in the road and actually gone to have a look at the site. Thank Goodness there is no information board! Some places are better left to the imagination. Having said that, your detailed information about the possible solar alignments are so intriguing. As you say, there is a wisdom we have lost in the gaining of other knowledge. Thank you! Interesting that you’ve always thought it was a Norse chieftain’s grave. I’m guessing you might have read the comment of Colin MacDonald (above) – I looked up the Battle of Barbreck on Canmore and it is preserved in folklore that a Norse prince, Olave, was killed there around 986 AD. This doesn’t explain the site’s entire history, of course, but it’s fascinating as a possible connection. Love this post Jo. I’m always attracted to standing stones, but this one seems to have a particular power as a lone sentinel keeping watch (and yes, I can see the face too!) – I’d love to visit it one day. I find prehistory the most intriguing historical period, probably because there are such evocative mysteries associated with it that we’ll never know the answers to. Thank you very much, Andrea! 🙂 Yes, that’s precisely why I love prehistory too. I didn’t expect this site to have such a wealth of alignments, and I had no idea about all the surrounding sites, but as always there is so much more to discover. I just love it! Well-said and thanks for the interesting article, Jo! You’re very welcome! Really glad you enjoyed it! Thank you so much! That’s lovely of you to say so. I had a look at your site, and I love your carvings! Very interesting, I have also worked out that this site was important and fascinated me when I first saw it. My husband is very patient as he watched me being totally absorbed in the site! Good to hear that, Phyllis! It’s a wonderful stone, and in such a fabulous setting as well.